Triphenyl Phosphate TPP Use - ZhangJia Gang YaRui Chemical Co., Ltd.
Triphenyl Phosphate TPP has many advantages, such as excellent transparency, softness, bacterial resistance, and water proof, grease-proof, good electric insulation, as well as good compatibility. Triphenyl Phosphate TPP Use as the flame-retardant plasticizer for cellulose resin, vinyl resin, natural rubber and synthetic rubber. And it may also be used as the flame-retardant plasticizer for glyceryl triacetate thin ester and film, rigid polyurethane foam, phenolic aldehyde resin, and PPO, etc. Triphenyl Phosphate TPP is a kind of halogen-free environment-friendly flame retardant with phosphorus element. Most of the products in the market are self-colored flaky crystal, our product is self-colored crystalline powder, and is more soluble in organic solvents. 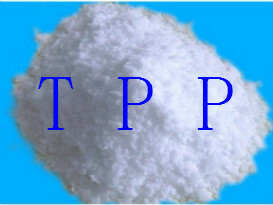 TPP is not soluble in water, but soluble in benzene, chloroform, ether and acetone, and slightly soluble in Z alcohol. Triphenyl Phosphate TPP is nonflammable with slight aromatic odor and slight deliquescence. The fusion point is about 50 ℃, and fast melts to hoop-shape when heated. The lubricate effect is excellent, and it is often used as the flame retardant plasticize lubricant. What is more, it is used as the flame retardant for many plastics and resins, such as phenolic aldehyde resin, epoxy resin and so on. Above is the detailed introduction Triphenyl Phosphate TPP use, for further information, please contact us. If Triphenyl Phosphate TPP Use product is not what you want, we can be customized according to your needs, please send us your order to Email: sales@yaruichem.com , or click here to post your buying lead.